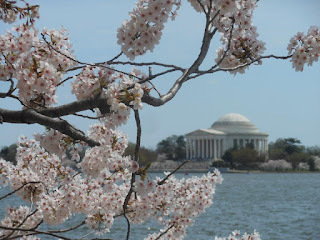 I was happy to see today’s blog post from the tree-loving/tree-supporting Casey Trees Foundation – see below – which struck me as an excellent follow-up to the column above, posted yesterday, about our cherry trees in bloom. Go to the Casey Trees map at http://bit.ly/2VvRnPb (copy and paste the link) and you will find a tree-by-tree guide to every flowering tree in town. If you want to see beautiful blossoms, you don’t need to go anywhere near the densely packed walkways around the Tidal Basin. A great resource for agoraphobes – or just people who hate to be stuck in tourist mobs! Tourists from all over the country — even the world — flock to D.C. to get a glimpse (and the perfect Instagram) of the cherry blossoms lining the Tidal Basin. However, the Tidal Basin is not the only place to find those cherry blossoms — nor is the cherry tree the only tree that produces beautiful blooms!